Makin’ me look good again… – …STILL CRAZY AFTER ALL THESE YEARS! I sent my car for a thorough bodywork, a complete paint job and all. …in 2015 when I went to my girl’s school in the jungle on a Friday to pick her up and take her home – it was pretty obvious that a colleague was in a hurry to go for prayers and probably did not notice my car parked by the side and reversed right into it. To this day, I do not know who it was as nobody ever came to tell me. The right side was not spared either. I was cruising along one day and decided to change lanes as I wanted to make a u-turn at the traffic lights ahead. Suddenly, somebody rammed me from behind, hitting the car at the side from the back till the passenger’s door, damaging it a lot more severely than what one can see in the above photograph. It turned out to be the grand-daughter of a relative of mine, right after Form 5 and obviously, a newbie at driving. Never mind, I thought, since we’re family so I offered to pay for whatever repairs that needed to be done. What got me quite pissed me off was the grandma’s remark at that point in time. “Why did you drive so fast?” she said. Gee!!! I was flabbergasted! I could not be sure but I was positive I did not see any car coming and I always use the indicator without fail everytime – the grand-daughter probably stepped on the petrol in a panic instead of the brakes…and if there is a problem with my driving, it is the fact that I am too slow or in the town centre, at least. Old retirees like me are in no hurry to go anywhere…not just yet. There were, of course, bits of this and that here and there and how they got to be where they were, don’t ask me! I wouldn’t know! Anyway, though the engine was in tip-top shape and I only need to get it serviced regularly – no big problem, no headaches and heartaches, it certainly was not a pleasant sight. The problem was I sold off my other car, the 1st generation SAGA, so I needed this one to go here and there and for my weekend chauffeur duties and I just could not find the time to go and get it done. …on one of the days. …to enjoy and also in the hope that it might help cool us off a bit. …a local sweet potato delight *click link for recipe* and yes, it was very good. …with prawns and chicken, substituting the saffron with serbuk kunyit (turmeric powder), and it turned out very nice. I guess one can’t go wrong with prawns but I thought it would be nice to have, instead of the chicken, more varieties of seafood in it, sotong (squid), mussels, clams and the like. I have never had this before so I am in no position to say whether it was anything like the real thing but we did enjoy it and I guess that was all that mattered. Yes, weather very hot recently and I want some of the green bean dessert to cool down, hee hee. The local delights look good and the Spanish Paella is something I have not tried, looks like briyani rice. It certainly did not taste like biryani rice – between the two, I certainly would prefer that but it was nice, just that I would rather go for Indian, instead of anything continental or western, with the fragrances of all the herbs and spices. It is getting hotter and hotter and hazier and hazier by the day. Sighhhh!!!! Wow! 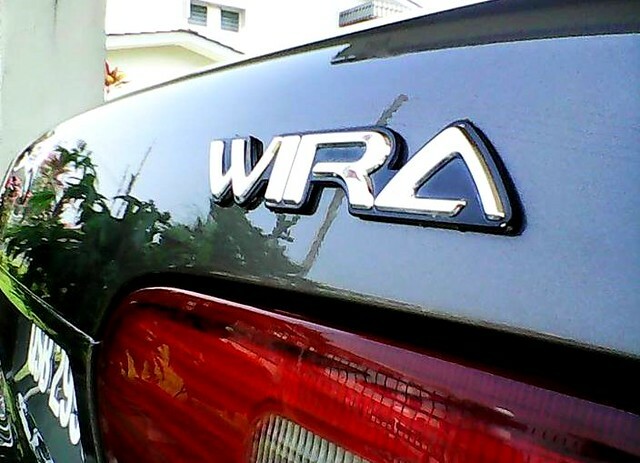 Your car sure looks brand new after the makeover. I believe the driver who hits another car from behind is always the one kena denda when making a police report so obviously the grandma was ignorant about this fact when she made that snide remark. Did you say anything at that time back to her in defence of yourself? 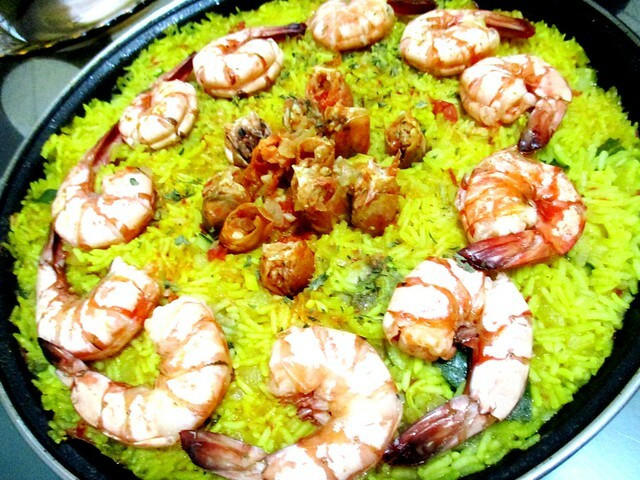 All your home cooked meals are so delicious looking especially the paella Melissa prepared. 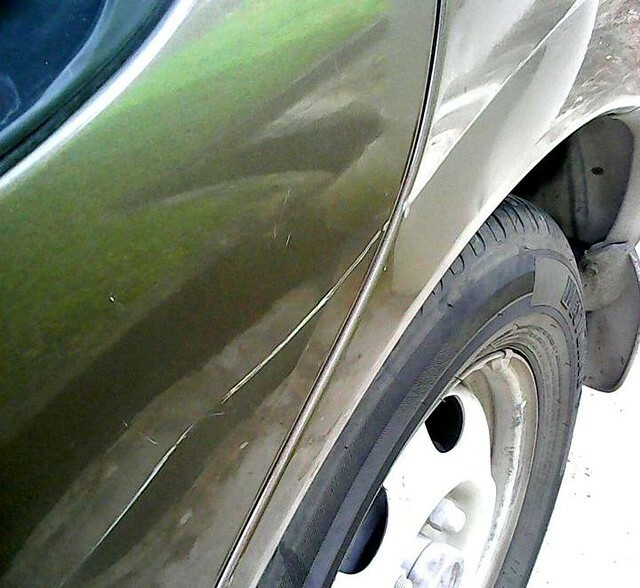 No, I did not say anything, no point creating any ill feelings – after all, mine is an old battered car. In the end, she just said that we would see to our own repairs so I just left it at that. Case closed. Thanks for your compliments about our cooking. It is always good to boil green beans to cool down a bit during this hot and hazy weather. 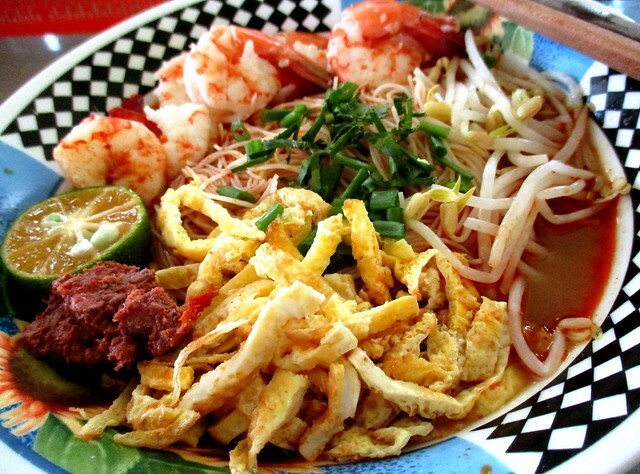 I would love that bowl of Sarawak laksa. It does look good, eh? I was delighted as to how it came out in the photograph, mighty impressive. LOL!!! We recently sold our car that was 17 years old. It was just breaking down so much that the repairs were adding up to the price of a new small car! Yes, when it is causing a lot of problems, it is best to let it go. 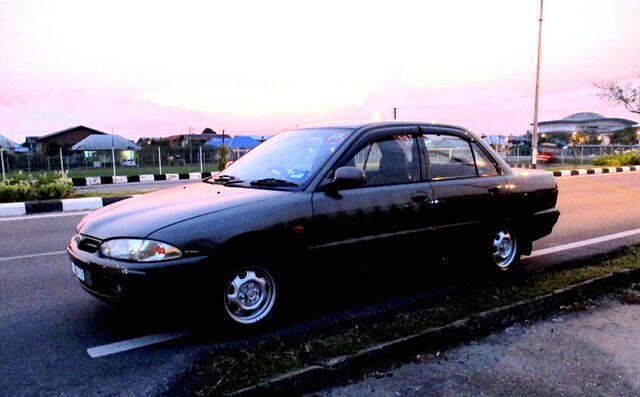 I had that same experience with my Ford Laser a long time ago and more recently, with my first-generation Saga – we hardly ever used it after we all retired but even when left there idle, problems stared to crop up so I had to let it go. This one has been good all this while, touch wood, no need for frequent repairs, just the regular routine servicing. That is why I am keeping it as a second car. 24 years is good length of time to be owning the same car. How many km done? Around 80,000 on the speedometer. Would be a lot less if my girl had not been posted to her school in the jungle, 99 km away. Sibu is a very small town. 80,000 is still like new. My 14 year old has done 140,000. It would have been less if I do not have to travel so far on weekends, getting my girl home and sending her back to her school in toe jungle, around 200 km return X 2. Yes. so so hot these days. Best to stay indoors. 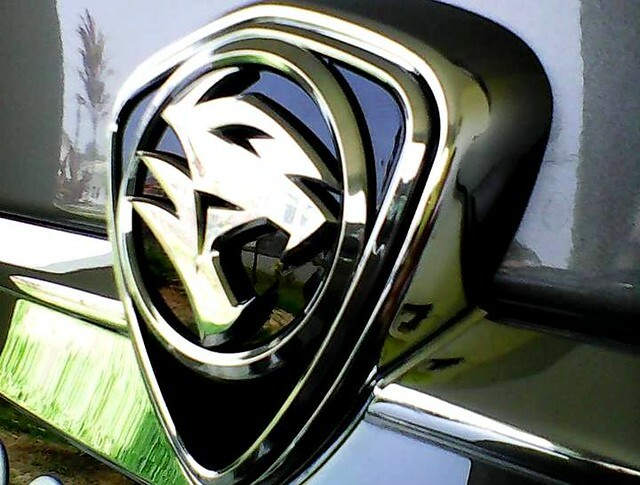 You have maintained your car so well and it deserves the makeover. Melissa is quite the cook and baker. Her kuih keria and paella look really good! Yes, she does it well, not like the father, chin chai chin chai one. LOL!!! Wow! 24 years old and counting, and it still look good! Lovely painting and touching up. Really hot lately. 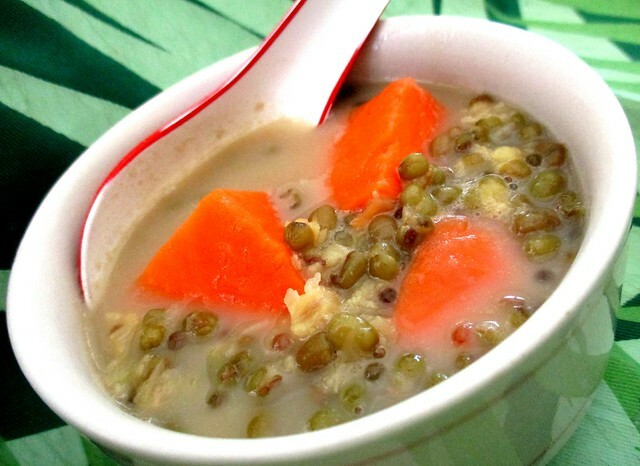 I keep cooking mung bean soup and buy lek tau suan and coconut juice from market. Anything to cool ourselves down. Sweet potato donuts, I like some. They were very nice, nicer than the regular ones at the Malay stalls probably becuase she used a lot more sweet potatoes. Love them so much! 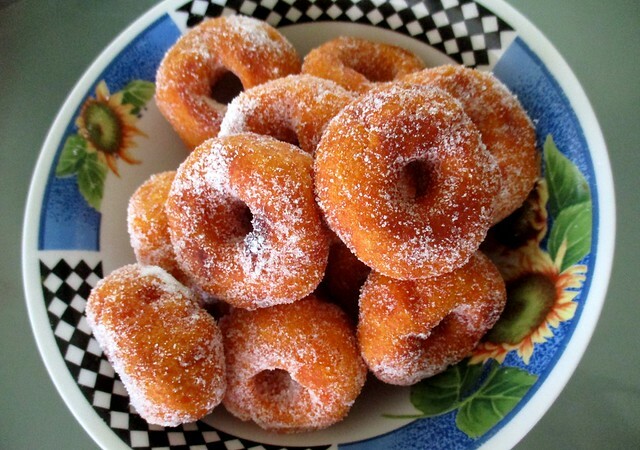 I do like them dusted with sugar like this too, not like the usual – glazed with sugar syrup. I wish I could cook let tau suan – the only one we have here is just so so, can’t complain when there is no other place selling it.